One of the most common aftermarket upgrades to your BMW is a set of wheels. HRE is a manufacturer of killer high-end wheels for sports cars and recently they came out with a new line of wheels called FlowForm. Instead of being forged, the new wheels are made in a casting process by pouring molten aluminum into a mold. This casting is followed by rapid cooling which makes a wheel similar in strength to a forged wheel but comes with significant cost savings. To elaborate on the FlowForm production process a bit: It begins by pouring molten aluminum in a mold face side down which is then rapidly cooled. The aluminum is thus condensed, enhancing its elastic strength and durability. After the FlowForm wheel is formed, it is removed from the mold and placed in the special flow forming tool. This is perhaps best described by relating it to a potters wheel. Here the FlowForm wheel undergoes a process where the barrel is stretched to a defined profile and thickness. This ultimately gives the FlowForm wheel its final shape. The “stretching” improves the grain structure of the aluminum making it stronger, lighter and more precise than a non-flow formed barrel. This flowforming results in forged aluminum like strength. BMWBLOG threw a set of FlowForms on our E92 M3 to see how they feel, fit and look. More importantly, we wanted to know if these new FlowForms were worthy of the hallowed HRE name. FlowForm wheels are 7-double spoke wheel with starting weight around 22lbs. The inside face of each double spoke is dished out. This gives an interesting visual detail as well as helps save weight. The edges of the double spokes connect with the outside of the rim in with a very sharply delineated edges. The Gloss Silver has a very deep luster next to the Space Gray Metallic on our E92 M3. When you run your fingers over the wheels, you can feel a very smooth uniform finish with absolutely no pitting. I realize that looks are subjective, but HRE wheels are a work of art to me and seeing them up close you can tell that not only are they gorgeous but extremely well made. The edges of all the spokes where they hit the barrel of the wheel are uniform and without flaw. The biggest thing I noticed after installing them was how much more they fill out the wheel wells compared to the 19” BBS Competition wheels. Another benefit was how much more contact patch you get with these wheels versus the Competition Package wheels. 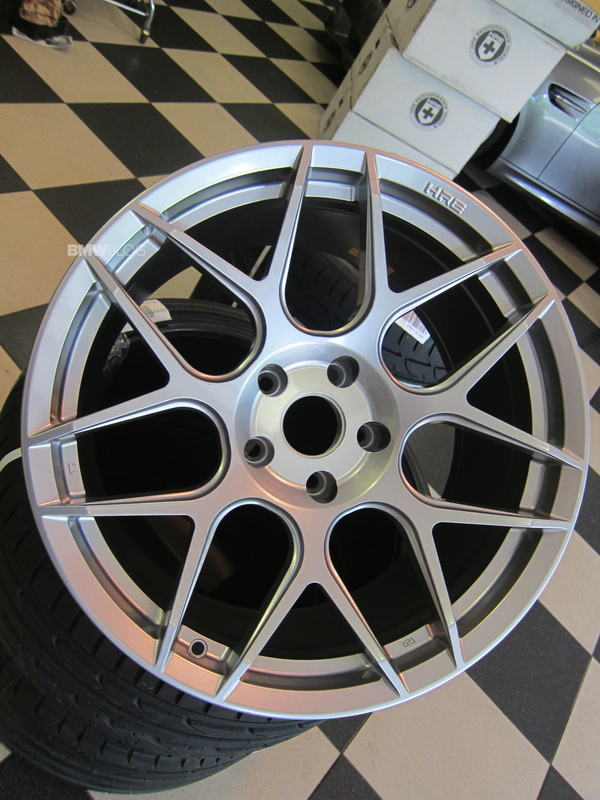 The fronts of the HRE’s give you 20mm more grip on each side and the rears 30mm more grip on each side. That’s a total of 100mm more contact patch. 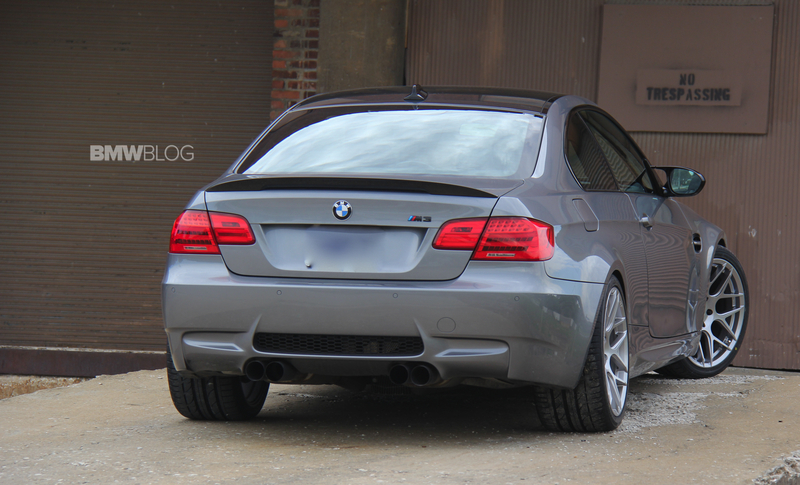 When were photographing the M3 from the rear, we could see how much wider the rear tires are – 295’s vs 265. The extra width along with the wheels that fill out the wheel arches are more completely now and add to a very aggressive stance on the E92 M3. 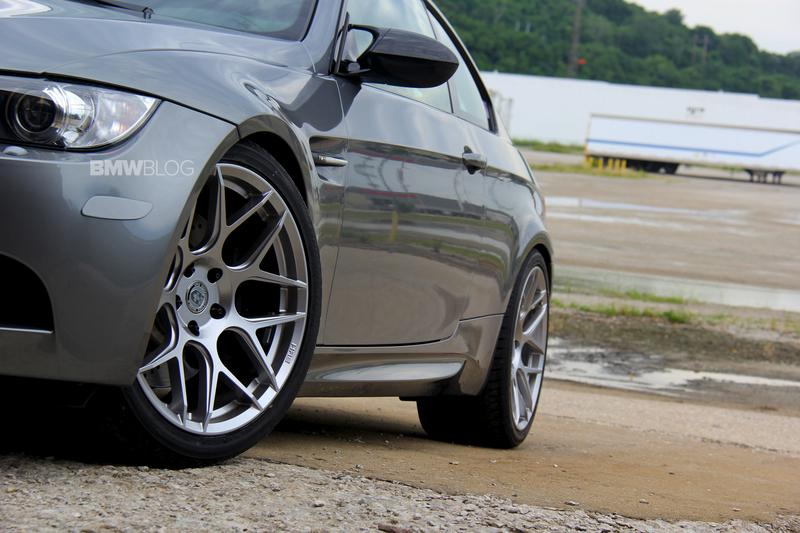 When it came to choosing tires for the HRE’s, I wanted Michelin Pilot Super Sports. We own several sets of the Michelin Pilot Super Sport, for a full review of these read here. Unfortunately they were back ordered for months for the rears. Apparently the 295/30/19 size for the Super Sports is a unicorn when it comes to finding it in stock. Enter the Bridgestone Potenza S-04 Pole Position, the Potenza’s are about 25% less expensive than the Michelins and in comparison tests consistently come in a close second the Michelin Super Sports. So off went a very reasonable $828 to TireRack for the set. 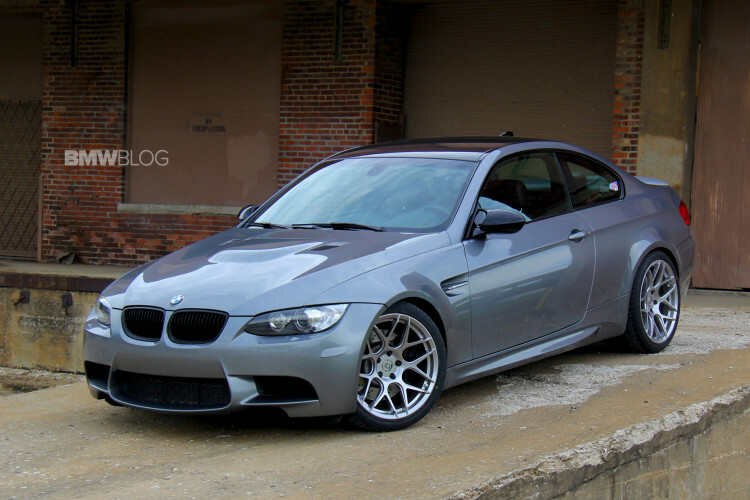 Next I decided that I would add Tire Pressure Monitoring to the HRE Flowforms to work with the M3’s TPMS. I researched several options and decided that the 433MHz TPMS set up from Tire Rack for $228 would be compatible with my 2011 M3 TPMS system and not cost near as much as set from BMW which run around $400. TPMS is super easy to install on new wheels so, I decided to save myself some coin and install the TPMS on the wheels before I got the tires mounted. When it came time to install the HRE wheels, I decided to stack them up next to the M3’s Competition Package BBS wheels to get an idea of just how much more grip I was getting. When installing wheels onto any car, I like to use Griot’s Garages protected sleeved 18mm deep welled 1/2 socket so that I don’t scratch the wheel. I’ve used these for years and not damaged any wheel on BMWs or Porsches. Once installed, I torqued all the wheels to 90 ft/lbs and after about 75 miles I like to re-torqued them. 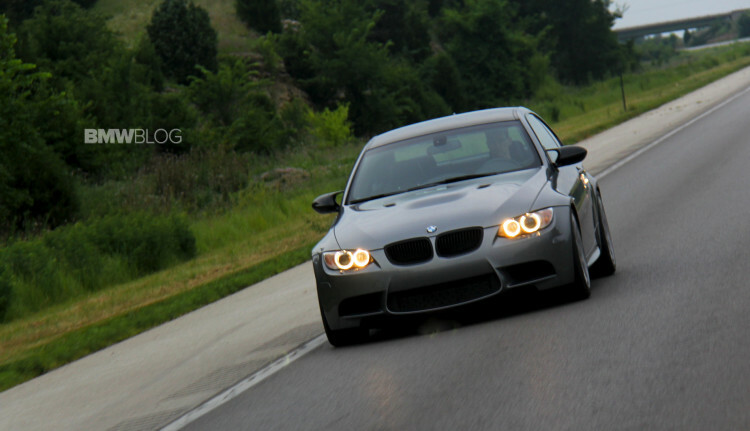 With a wider tire, I did notice a little more tram lining on our M3. The grip though was great. Pitching the M3 hard into a corner the extra grip was noticeable. As our M3 is lowered, one of the main concerns I had was rubbing. I am happy to report that there is no rubbing and I do not have to roll fenders. Even fully loaded up in a corner under power, I could not get the HREs to rub. Anytime one lowers a car and puts bigger wheels, this is of prime concern. Another concern when you step up in wheel size is ride quality. 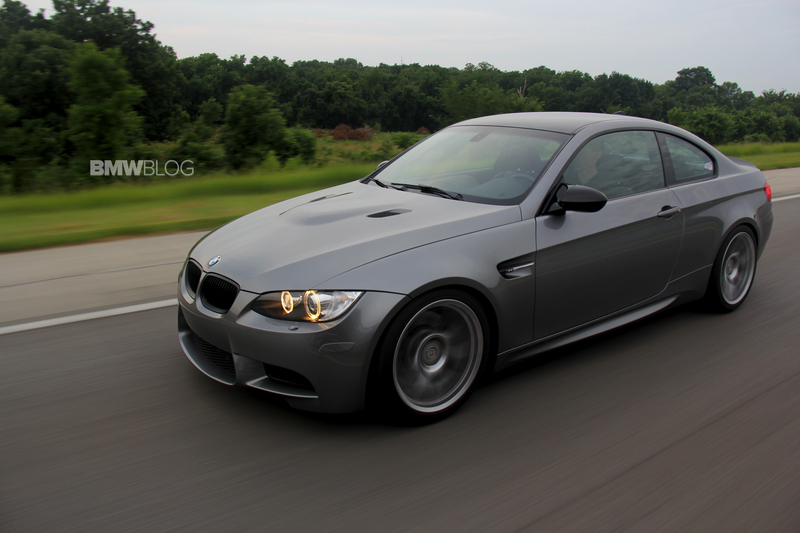 The E92 M3 is already a pretty stiff and solid ride, plus ours has lowering springs on it. I did not discern any harshness from expansion strips or the occasional imperfection in the road such as pot hole I ran over. 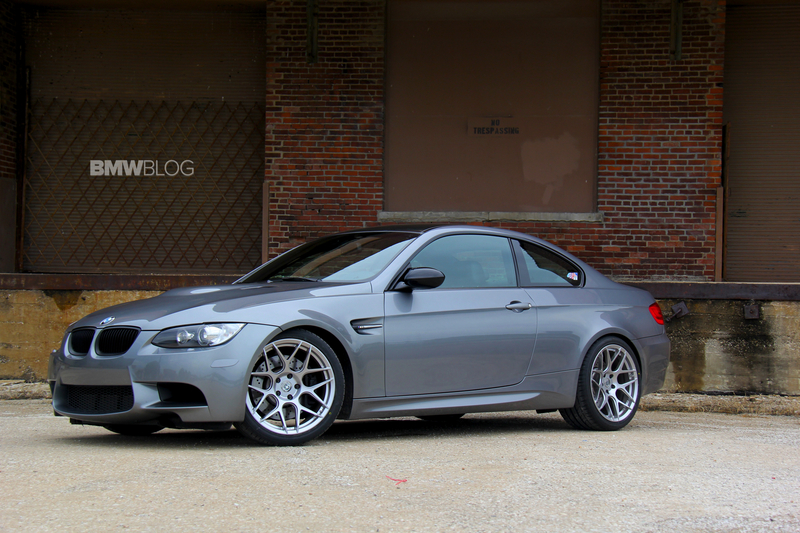 The FlowForm FF01 comes in 19 and 20” sizes that will fit the E92 M3. I chose the 19×9’s for the front and the 19×10.5 in the rear. List price on the 19’s is $725 each and the 20” wheels list for $775 each. Shipped in carefully packed boxes, HRE sends center caps as well as high quality valve stems. HRE FlowForm wheels fit BMW 1 Series, 3 Series, 4 Series, 5 Series, 6 Series, including the M versions of these as well as the X1, X3 and Z4. They come in Satin Black and Gloss Silver but can be made in custom colors. While the HRE’s forged wheels are made in San Diego, the FlowForms are made in Japan under very strict quality control. Most important to me was that the fitment of these wheels on my lowered M3 was perfect and the FlowForms most definitely are deserving of the HRE name.